One of the things that interested me about the game’s description was some of things that inspired Star Control. 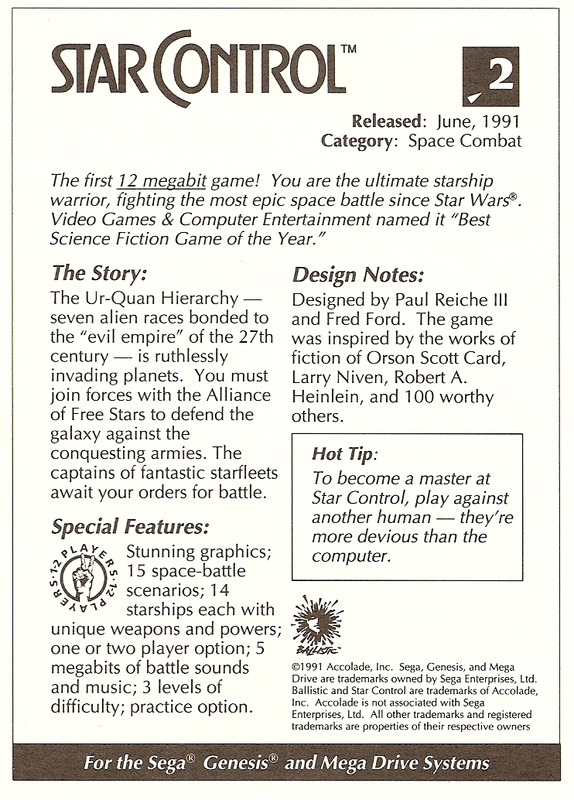 While it’s obvious that Star Control does have influences from other works, Accolade mentioned Orson Scott Card, Larry Niven and Robert A. Heinlein as some of the 100 worthy inspirations. Personally, I don’t know much about these particular authors. They are very popular Science Fiction authors and I haven’t read any of their books before. Even though I am a Science Fiction fan, I just don’t read as many novels as I used to. Anyways, check it out. 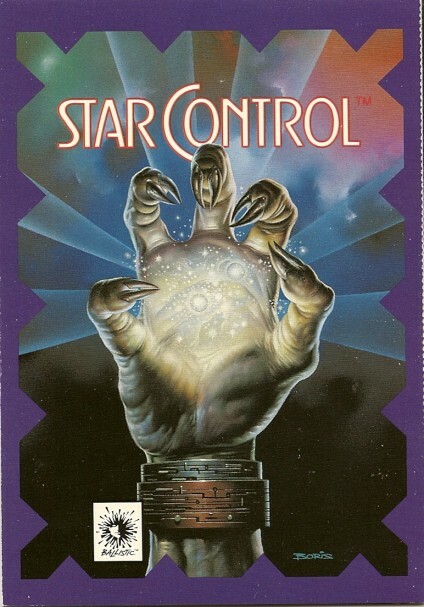 I’m not sure how many people have seen this before and I know it will be interesting to anyone who’s curious about what Accolade did to promote Star Control before their downfall. "Inspired by the Works of Fiction of: Orson Scott Card, Larry Niven, Andre Norton, David Brin, Robert A. Heinlein, Arthur C. Clarke, Jack Vance, Alan Dean Foster, Keith Laumer, A.E. Van Vogt, E.E. “Doc” Smith, Joe Halderman, Dan Simmons, Fred Saberhagen and 100 worthy others." I didn't know about those cards, that's pretty interesting. Sad to think that Accolade later went from promoting SC to spitting on it. Niven and card are great, although i dont know Heinlein. some of the best sci fi aside from clarke and asimov are niven and card! Having read quite a bit of Niven's work lately, I can definitively say that Star Control 2 is very muchly so inspired by his work. There are plenty of parallels. Seems to me I've seen one of those some where..
For Heinlein, I'd recommend: Starship Troopers (unlike the movie); Have Spacesuit, Will Travel; and The Moon is a Harsh Mistress. He wrote a lot of good books, and a large number of sketchy ones.